First and foremost the concept of HOW DO YOU PLEAD is far from new and to some degree has been done to death over the years; but when a record is half as good as this is I’m legally obliged to shout about it from the rooftops. I like to think I have my finger on the metaphorical musical pulse but My Darling Clementine seems to have appeared out of nowhere in a puff of smoke. When the CD first arrived I was initially impressed by the expensive looking three part album cover and retro artwork; but obviously I shouldn’t ‘judge a book/CD by the cover’ so suspiciously slipped it into the player and sat back. I was instantly hooked from the opening breathy vocals and beautiful harmonizing of By a Thread and was whisked straight back to the great duets from my youth by Tammy and George, Gram and Emmylou and Loretta and Conway Twitty. In these days of I-pods and downloads HOW DO YOU PLEAD is a welcome return to the days of records that you simply must listen to from start to finish; as every track is solid gold and one or two are even encrusted with diamonds. She Is Still My Weakness made me go weak at the knees and the final track Goodnight Louise nearly had me blubbing like a baby even though both have a wickedly funny streak running right through them. Listening to Reserved For Me and You had me scratching my head to remember who had recorded it first; but no; all of the songs here are brand spanking new and; just like Elvis Costello’s ALMOST BLUE album pay homage to their Country forefathers by taking a well worn formula and bringing it bang up to date in a way that will appeal to a whole new generation of music fans. It’s not just the fantastic voices that make this album a keeper; the songwriting throughout is spectacular and as each song is littered with sublime guitar picking, an ultra tight rhythm section and pedal-steel straight outta Nashville ……only it’s not outta Nashville; it’s all from London Town! It took me three listens to summon up the courage to read the bio that accompanied the album and what I read made me blush with embarrassment. 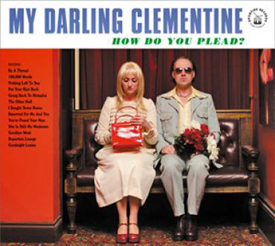 My Darling Clementine is a vehicle for ex-Good Sons and long time hero of mine Michael Weston-King and his young wife Lou Dalgleish and the band; well if I’d put a ‘Supergroup’ together of British Country musicians I’d be hard pressed to do better myself with Martin Belmont and the God-like Genius of Geraint Watkins heading up a long and mighty cast list. Many people will buy this album and treat it as a ‘best-of’ Country Duets but an inquisitive few will be drawn into the music that has influenced Michael and Lou and what a treat they have in store.